Dinner at the 14 points GaultMillau Restaurant Eden at the Hotel Eden au Lac in Zurich, combines the culinary artistry of Executive Chef Ludovic Pitrel and live jazz music. 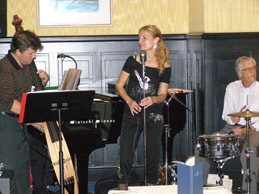 Hot jazz and inspired cuisine what could be better than that? Edward F. Nesta and I had a fabulous dégustation dinner at the Restaurant Eden in October 2006, on the first night of the winter Jazz season at the Hotel Eden au Lac, which features live jazz on Thursday and Friday evenings with Rebecca Spiteri & Rolf Lyssy Trio (Rebecca Spiteri, vocals, Jürg Ramspeck, piano, Peter Livers, bass, and Rolf Lyssy, percussion/small drum). We entered the restaurant with Rebecca singing the classic jazz song, "Stella by Starlight," and knew that we were off to a very good start. Since there was a charity event in the dining room, Restaurant Eden's guests had dinner in private rooms featuring sparkling crystal chandeliers, blue and yellow silk moiré on opposite walls, blue and gold patterned carpet, wood chairs covered with blue and gold fabric, tall windows trimmed with opulent floor to ceiling striped fabric, and plants against one wall. Tables elegantly dressed with white linen tablecloths and napkins, silver candlestick holders with tall white tapers illuminated the room, with giant white chrysanthemums arranged in vases filled with autumn leaves completed the ambience. Our server, Jana Englebrecht, began our dégustation menu with a bottle of 2005 Chardonnay Barrique, E. Meir, Weingut Erich Meier, Uetikon am See, which spent 14 months in French oak barrels to pair with our trio of Amuse Bouches. Edward's Amuse Bouche consisted of sweetbreads with a bone marrow crust on lines of spicy sauce, a filo cup filled with filled with creamy mozzarella topped with oven baked diced tomatoes and fried rocket, and shrimp tempura served on a rectangular plate with lines of pesto sauce. My Amuse Bouche consisted of sole tempura on a skewer, a filo cup filled with creamy mozzarella topped with oven baked diced tomatoes and fried rocket, and shrimp tempura. Rebecca and the band segued into the Gershwin tune, "They Can't Take That Away from Me," just as our first course of Tuna Variations: Ventresca, Sashimi, Mojama with Three Sauces and Herb Salad arrived, which was our sentiments exactly at the expertly prepared tuna. Artistically presented as herb salad made with parsley, dill, basil, tarragon, and sage mixed with vinaigrette, in two corners of the plate, and three tuna variations, this dish worked well with the interesting combination of herb flavors. Edward continued with a second course of Soft-Boiled Egg with Boletus Cream, Raw Ham, and Fried Parmesan, presented in a large deep bowl with shaved ham crowning the soft-boiled egg on the rich mushroom cream. I had a mixed salad for my second course presented in a square glass bowl with vinaigrette served in a shot glass on the side of the rectangular art glass charger plate. The salad was a mélange of mesclun, herbs, Nicoise olives, julienne sun-dried tomatoes in olive oil, thinly sliced julienne radishes, sprouts, baby carrots, and crowned with thinly shaved feathery scallions. The third course, King Prawns with Sherry Vinegar Sauce, White Beans with Piquillos, Sun-Dried Tomatoes, and Olives, was another appealing dish with interesting textures and flavors. The prawns were presented on a bed of white beans cooked al dente, the slightly salted Nicoise olives, piquillo peppers, sweet sun-dried tomatoes, and sherry vinegar sauce combined to provide a complementary contrast of flavors. For Edward's fourth course, he had Roasted Venison Fillet with Pepper Gravy, Red Cabbage with Figs and Spätzli, excellently paired with a 2004 Diolinoir, E. Meier, Weingut Erich Meier, Uetikon am See. This course also made use of contrasting flavors of sweet figs, red cabbage, creamy spätzli, rich gravy, and venison. I had the Red Mullet with Bouillabaisse Sauce, Fennel Mille-Feuille with Olive Tapenade presented on a large square plate, was a lighter course, and for that I was extremely grateful, as I could not wait to sample dessert. Rebecca had perfect timing as she belted out the Diana Krall song, "Devil May Care," just as Chef Pitrel sent us a Greeting from the Chef of vanilla ice cream balls coated with dark chocolate and served on a curved spoon, which were tasty little temptations to spike our appetite for the dessert course. Dessert followed with Quince-Pumpkin Mille-Feuille with Five-Spices and Olive Oil Ice Cream, which was absolutely heavenly. Another mélange of flavors and textures, this dessert was a yin/yang of savory and sweet combining a crispy, caramelized gallette with layers of diced pumpkin and quince, with an enticing quenelle of olive oil and five-spices ice cream garnished with mint, with olive oil drizzled on the plate, sprinkled with five-spices and finished with a chocolate swirl. We had just finished dessert when Executive Chef Ludovic Pitrel appeared at our table bearing a tray laden with sweet treats that included Pear Mousse, Cotton Candy, Coconut Saffron Cookies, Almond Macaroons, Cornflakes with White Chocolate, Grapes with Dark Chocolate, Dark Chocolate with Fig Marmalade, and Bubblegum Ice Cream. As I sighed with delight sampling the whimsical artistry of the desserts, Chef Pitrel said, "Dessert has to be even more fantastic as a final souvenir," to which I replied, "You succeeded!" We returned to the restaurant two nights later to have one last taste of Chef Pitrel's cuisine before returning to the United States. In a celebratory mood, our server Michaela Böhm, began our evening with an aperitif of Champagne Eden au Lac Zurich, Edouard Brun, Ay to accompany our Amuse Bouche of three slices of Mojamba with two triangles of brown bread toast with XO sauce. Since the hotel Eden au Lac opened in 1909, it has played host to many heads of state and celebrities, including the Prince Aga Khan, who lived at the hotel Eden au Lac during World War II, and liked to have the restaurant prepare him many tempting small dishes, creating the first dégustation menu. The Aga Khan menu became so popular, that it remains on the menu as Hors d'Oeuvre Chaud. Since it was our last night at the hotel, Edward selected the Hors d'Oeuvre Chaud menu, while I selected from the a la carte menu. He began with the Barquette Pawlowa, ris de veau frit, presented on a rectangular art glass plate with marquis shaped puff pastry topped with horseradish cream, salmon and caviar on one side, mixed lettuces with vinaigrette in the center of the plate, and deep-fried sweetbreads on the other side. 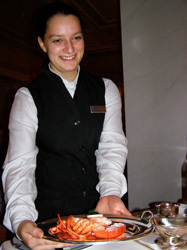 I began with the Lobster Cocktail, which Michaela prepared tableside by removing the lobster from the shell and cut it into medallions. She next made the sauce with tomato sauce, mayonnaise, spices, and Armagnac. Finally, she placed the lobster on a bed of chiffonade greens in a silver coupe and finished the presentation with a generous serving of sauce, a slice of hard-boiled egg, caviar, dill, and garnished with julienne parsley. We paired our first courses with a 2004 Chablis AC 1er Cru, Vaillons, Domaine William Fèvre, France. Edward's tasting menu continued with Scampi grilles, sauce tartare, which were two large grilled succulent shrimp with tartar sauce. For his next course, he had Filets de sole Prince Murat, which were two filets of sole placed in the center of the plate with potato balls and quartered artichoke bottoms placed at intervals around the plate. He continued with Crêpe Rossini filled with foie gras, glazed with a truffle sauce, and garnished with two baby carrots. For my second course, I had Mushroom Ravioli with fennel sauce, which were three homemade tender ravioli filled with a savory mixture of mushrooms, bathed in a fennel sauce, and garnished with dill. For Edward's last course, he had the Mignon de boeuf Helder, paired with a 2001 Aragonês Vinho Regional Estremadura, Quinta de Pancas, Portugal. This course was beef with a Béarnaise sauce with mixed vegetables, bok choy, miniature Brussels sprouts, and baked tomato. The dinner deliciously ended on a sweet note with vanilla ice cream balls coated with dark chocolate and served on a curved spoon, and more of Chef Pitrel's heavenly dessert creations. 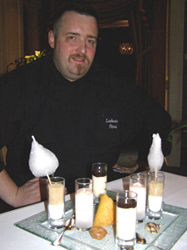 Read the articles on the Hotel Eden au Lac in the Hotels and Resorts, and Chefs' Recipes sections where Executive Chef Ludovic Pitrel shares a few of his creative recipes.